Love this site. I’m looking to make a life size Oscar Statue (about 5ft tall) and I’m undecided in how to start my pattern. I see you often start with a side profile pattern for your animal sculptures but I was thinking it may be best to start with a front view first for this project then do the back, what would you suggest? Hi Bill. That would probably work best. I haven’t used patterns for figure sculptures yet, but if I did I’d probably do it your way. Good luck with it! I am so impressed by your work. I need to make a horse- not life size, but larger than a toy for a civic club event that has a theme of the Kentucky Derby (horse racing). I have to have a pattern as this is new to me. I know you don’t have a horse pattern, but do have a unicorn pattern. Any suggestions? Thank-you for your help. Hi Shay. I suppose you could make the unicorn pattern a lot larger with the grid method or by printing it larger, but it doesn’t really have the proportions of a real horse. You should watch my video that shows you how to make a pattern for a four-legged animal using a photo or drawing. It will make the type of pattern that only sets the outlines of the body, head and legs, but it won’t fill out all the rounded forms of the face and body like the head patterns on this page. But it will certainly get you started. You can see the video here. If you want to make a smaller horse to practice, it’s one of the last projects in my book. I am making a face mask and I wondered if I could use Watercolour paint in the gesso mix ? Hi Nicholas. It won’t hurt anything, but you’d need to add a lot of pigment to get anything other than a light pastel. The whiteness of the joint compound will tend to cancel out the color. For deeper colors, powdered pigments might work better. Thank you for your prompt reply and information . i will try to purchase some pigment . I expect I’ll be in contact again soon on another project I’m hoping to start. I want to do a sculpture that I can put outside. I thought you had a recipe for that but I can’t find it. Joan, I’ve done a lot of experiments to try to find a fool-proof way to make paper mache weatherproof. My experiments failed, but we do have several guest posts from people who had better luck. You can see Tom’s bear here, and Linda’s outdoor toadstool here. I now make my own outside sculptures with epoxy clay or concrete. You can see my squirrel here. And I should mention that the unicorn and mini-bunny on this page were also made with Apoxie Sculpt – they could go outside, but I keep mine in the house. Please add your complete raven pattern to your offerings! Hi Carol. Did you see the pattern on this page? And this is how I added the air dry clay. Thank you for the free book. I have ordered your book from Amazon. Great – thanks! I hope you like it. When you finish some of the projects come back and show them off on the Daily Sculptors page. I’d love to see how they come out. I have just recently decided to try to work with paper mache’ to make marionette puppets and dinosaur statues. I have enjoyed watching your You-Tube videos on your techniques and the inspiration it has given me to resume my creativity. It has been many years since I have worked with the traditional flour paper mache’ formula and I love your new version of the clay. I have tried making one batch already and it came out sticky and lumpy. Although this first batch was a failure I am keen to try again. I need a very thin consistency to apply a final smoothing coat to the details of my marionette faces without altering their features too much. Do you have any suggestions for me? Hi Theresa. The paper mache clay isn’t supposed to be lumpy, but it is supposed to be sticky. It replaces paper strips and paste, so it needs to hold on to the armature. Perhaps you used more paper than you need? In any case, there’s another recipe that would probably work better for you. I use my smooth air dry clay recipe when I make my dolls. You can find that recipe here. I think you’ll like it much better. Hi Jonni, I need to create a large octopus for an Under the Sea banquet on March 23, I am running out of time, any suggestions on which recipe would be best to use and what would be the best way to make the armature for the legs. Hi Nancy. For the armature, I’d use the same method that I used in my recent video, but instead of using a side view I’d try to get a photo of an octopus from the top for the legs, and from the side for the head. Or make a cardboard pattern for the inside of the head to get the basic size and shape right, then attach eight pieces of heavy wire to it for the tentacles. Wrap the wires with crumpled foil and hot glue, and bend them into interesting shapes. Hi Carol. I don’t have a tiger pattern at the moment. Are you looking for one of the three-dimensional patterns that create all the shapes for you, like the lion and wolf? Or are you looking for the whole tiger, legs and all? Hi Carla. 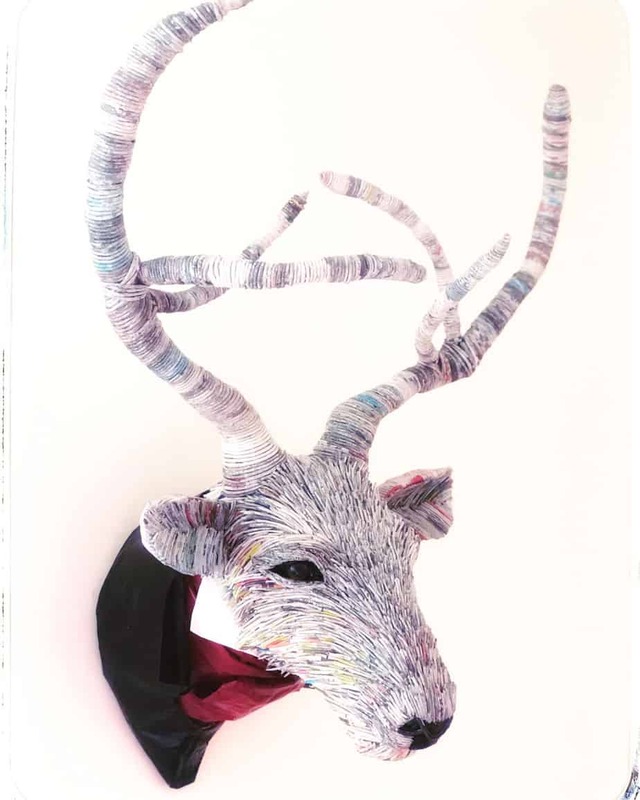 Harold is beautiful – is all of his fur and the texture on his antlers made with paper quills? That’s amazing work. I don’t have a fox yet. Have you tried sculpting a fox with modeling clay, and using it as a mold for your paper mache? The oil-based clay would need to be removed, of course, after the paper mache is dry. And the paper mache might need to be cut in order to get the clay out. Clay is my next mission, I’ve tried various armatures but I just can’t get a fox jaw right and I’m beginning to dream of fox skulls!! Lol. (Not that I’m giving up!!). Harold’s fur was made with rolled newspaper (which I wet first) to make newspaper noodles. I cut short pieces for his fur and used very long pieces to make the coils for his antlers which seemed to work well. He’s far from perfect, but as a first attempt I’m pleased with him. Thank you so much for your advice, I will put it to good use. Lately, I’ve been dreaming of dragons. Last week it was kangaroos – maybe the dream state is trying to help us out with our design problems? You can see the completed sculpture around the 8 minute mark. Hi Jonni, do you have any patterns for a cougar/mountain lion? Thank you! Hi Elena. Are you looking for a pattern for the whole animal, or one of the wall sculpture patterns like the ones on this page? Great – we have two posts that should help. Julie Ellis wrote a guest post showing us how she made her life-sized mountain lion. She even made it with materials that can go outside. You can see her post here. And I posted a video tutorial a few days ago that show you how to make a pattern for a four-legged animal. Julie used this method to make the pattern for her cougar, in fact. You can find that post here. Do you have a pattern for Pumbaa in the Lion King? My child is going to be playing that role and needs a costume very quick. Any suggestions on how to make the mold would be greatly appreciated. Your work is amazing. So very talented! Hi Jenn. The closest pattern I have would be the pig. I know it doesn’t look like Pumbaa, because my pig is young and cute, and Pumbaa is a warrior pig (and wild, not domesticated like mine). But it might be a good starting point, if you add tusks by crumpling foil into long teeth and attach the tusks to the mask with masking tape or hot glue. The nose needs to be slightly bigger, and pointier. That’s easy, since the end of the nose is separate piece and the shape can be changed without altering anything else. The ears need to be smaller than the ones on the pattern, and he’d need a Mohawk haircut, perhaps made with yarn or strips of cardboard. And the back, which is added so it can be hung on the wall, would not be used. I know it’s a stretch, but it’s the closest thing we have. I hope this helps. And I hope your child has a great experience acting in the play! I’ve recently discovered your blog and videos on YouTube and I can’t wait to try some of your techniques out! I’ve done simple, old fashioned paper strip mache in the past and am ready for another level. My first project will be a disc shaped African sun to decorate a friend’s catering table for a special event. I’m thinking a radius of about 12” and I’d like it to be somewhat raised, as it will sit on a table, behind the food. I think I may start the armature with a round wire wreath and build rays out from there with wire or cardboard. Do you have any ideas on how I might raise it off the table, while keeping it freestanding? 3 to 6 inches maybe. Thank you so much for everything you share! I am INSPIRED! Hi Jennifer. You could make a stand by pouring some plaster of Paris in a container, and sitting a dowel into it, standing straight up. Fix the dowel so it won’t fall over while the plaster is still wet. If the base is heavy enough, you should be able to attach the sun to it, and it would be raised as high as you want it. You’d need to make sure the base was heavy enough so it won’t fall over if bumped, because it could cause havoc with the rest of the items on the table. This sounds like a great project. I hope you’ll show it to us when it’s done. Hi Jonni! First, I love your page and all of your tutorials. Thank you for sharing your knowledge and creativity! 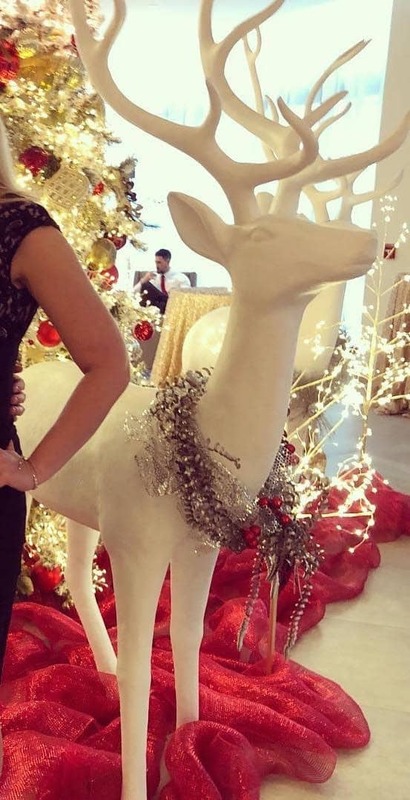 Friends of mine posted a picture of them at their company Christmas party. The Christmas decor was spectacular! Standing next to them was a life size, paper mache buck, with a Christmas wreath around it’s neck. I have been obsessed with making this deer, ever since. I’ve never paper mached anything in my life, and came across your page while do some research. After reading your post on making a full size horse, I was wondering if that would be a good template for me to use, when making the buck? The buck will be roughly twice the size of the horse in your project. I’ll attach a photo for you. Thank you so much for any advice you might have. I can’t believe I’m taking on such a project. I seriously have trouble drawing a stick man! The thought of sketching out the head of an animal, has me shaking in my boots, but you have given me hope and I’m going to give it a try. Thank you! Hi Alicia. I think you would be happier starting with a pattern you make from scratch. A deer doesn’t have the same proportions and shapes as a horse, and it would be frustrating to try to change a horse into a deer. I go through the process of creating a flat internal pattern for an animal sculpture, using a photo or sketch, in my book Make Animal Sculptures with Paper Mache Clay – but the main idea is fairly simple. Find a good photo of a deer that is taken from the side. Print it, or use a computer drawing program, and trace around the outside edges of the body on one piece of paper or layer, and the near legs on the other piece of paper or layer. Transfer the outlines to cardboard that is the size of the deer you want to make, using a grid. Put the pieces together, and add shaping with crumpled paper and masking tape. I plan to create a video tutorial explaining this process in detail, but it will take me a week or so to finish it. Good luck with your project! Can I use anything other than newspaper or blue shop towels, when making a mask? Shop towels are too expensive where I live, and newspaper just doesnt cut it for me…. i need something smooth. Would regular paper towel work… or toilet paper? I recently found some white paper towels in the local grocery store that were one-ply and smooth, like the shop towels. They would work. You can also use the brown paper that’s used to pad shipments from Amazon.com. That’s what I used on the African mask I made last week. And, of course you can use the paper mache clay recipe. can i make these mask and sculptures with the help of die…..
Do you mean cutting them out with a machine? I have no idea – sorry. Love your work. Do you have any patterns for birds? I volunteer with seabird rescue and we are wanting to make some birds to go on display when we do educational markets. Hi Fiona. There’s a chicken and a family of penguins in my book, but the only pattern on this site is for a snowy owl. However, the owl series shows you how to make your own patterns, so you could make an entire display of seabirds using those methods. You can find the first post here. Thank you for your kind thoughts, Tiziana. I must confess, though – I really prefer selling the patterns and books and helping other people make their own sculptures and masks, instead of selling hand-made art. I started the print-selling business just as an experiment to see if I could use Pinterest to send traffic to a new site. We get thousands of Pinterest visitors every day on UltimatePaperMache.com, and if I could figure out how artists without a blog could use it to sell their work, I would write a book about it. I have sold my dolls and sculptures in the past, but the patterns and books (and the wonderful people who buy them and become part of our community) are so much more fun. I am sad that I couldn’t figure out the Pinterest traffic thing, though. If it had worked, it might have helped a lot of artists who don’t have time to do any other kind of marketing. A while back there was a guest per video post ,someone building a armature for a whale and I can’t find it again, can you point me in the right direction please ? There are two guest posts with whales – this one and this one. I hope that helps. I was browsing for a paper clay recipe to create my next Halloween costume. I can’t wait now to get your recipes. I am very excited to start on my project as soon as I can. My – you like to give yourself plenty of time! Do you already know what theme you’ll be using for your costume? LOL ? Yes, I usually have an idea the day after Halloween. This year it is the Kraken. I want to make a headpiece that has tentacles. Whoah – I hope you show it to us when it’s done. That sounds fantastic.